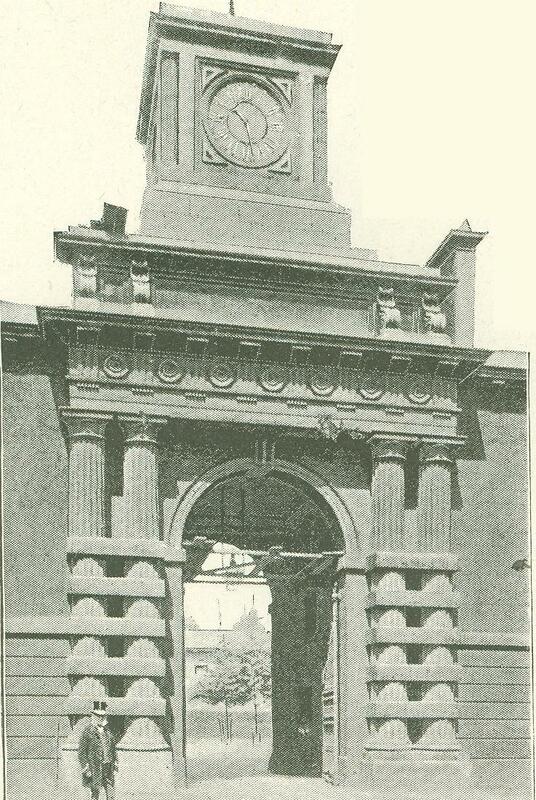 The main entrance to the stable is through the handsome gateway that opens on Buckingham Palace Road. The gates are very solidly built, and have considerable pretensions to art. 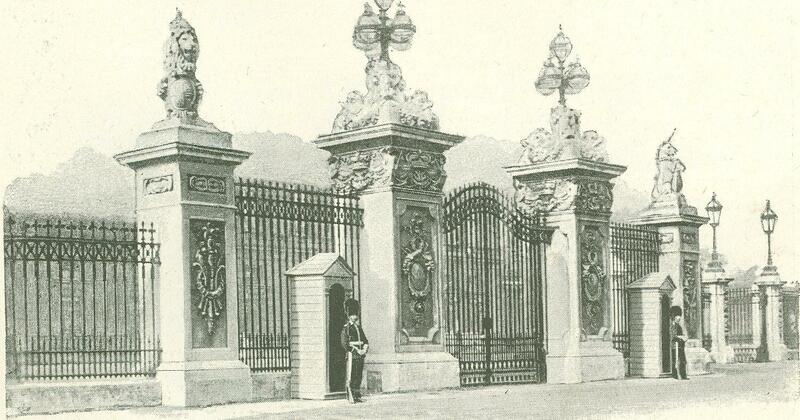 A sentry from the Buckingham Palace guard is always outside these gates. 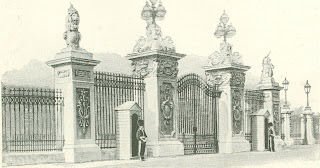 In the quad­rangle formed by these gates and the arch­way leading to the main courtyard are the offices of Mr. William Norton, the superin­tendent of the Royal Mews, with those of the Duke of Portland and his lieutenant, Sir George Maude. The main part of the work of arrangement and management falls on Sir George Maude and Mr. Norton. The former selects all the horses, arranges the proces­sions, and has the general ordering of affairs, while Mr. Norton looks after the minor details. To Mr. Norton is due the excellent appearance of the royal carriages, which always at­tracts the attention of those who have an eye for these details. Mr. Norton was for many years in the Royal Horse Artillery, and has occupied his present position for over thirty years. Some idea of the work required in managing such a large affair as the Queen's stables can be inferred from the fact that there are one hundred and ten horses in the stables, and eighty men employed as coach­men, grooms, and outriders. It argues well for the pleasantness of the royal service that servants of twenty-five years' stand­ing are common, and there are plenty who can boast of twice that number of years in the service of the Queen. A household medal is now given for over twenty-five years in the royal service, with a clasp for every ten years after that number. 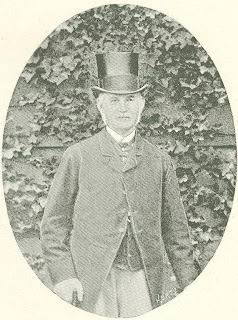 The head coachman, Mr. G. Payne, whose portrait is given, has been for fifteen years in his present position, and has served the Queen for over fifty years. He always drives the state car­riage in which her Majesty sits, and handles the ribbons over the famous "creams." We enter the Royal Mews through the main gateway, which is surmounted - as may be seen in the illustration - by a large clock, that chimes the hours. The whole Mews was designed by John Nash, of Dover, Kent, who also designed the palace. 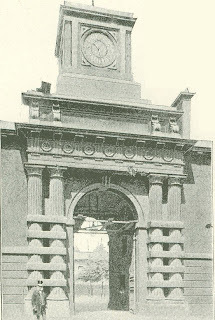 The work was completed in 1825. The courtyard is about four hundred feet square. 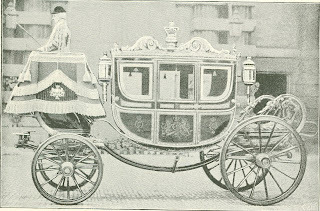 The right side is taken up by the royal carriages. Opposite these are the stables for the chargers, the harness-room, and several stables of carriage-horses. Opposite the entrance are the "creams" and "blacks," and the cele­brated thirty-two-stalled stable. I suppose in no stable in the world can such a collection of horses be seen. All are over sixteen hands high, and most over sixteen and a half. The general color is bay or brown, and white legs or feet are conspicuously absent. The ani­mals are all given names that com­mence with as many letters of the dealer's name as practicable, as a record of their purchase. Thus "Blackbird" and "Blackcap" were both purchased from a dealer Blackman, and "Jonquil" came from Jones. All the names are placed on iron plates above the racks. The floors of the stables are all sanded in patterns, and the straw litter is finished off with a neat straw plait. Against the posts - as can be seen in the picture of the "creams'" stable - are neatly ar­ranged sheafs of straw. There is a fore­man in charge of each stable, and to every eight horses a coachman, who has under him a competent number of men and an assistant coachman. The horses are all clothed alike in neat red, white, and blue rugs of a small check pattern, bound with red. The ini­tials V. R. are on the quarters, and the quarter-cloths have the same initials, with no display. The price of the horses varies from one hundred and fifty pounds to two hundred and fifty pounds apiece. They must be young, and pass a vigor­ous veterinary examination. After being purchased they are thoroughly trained. The chargers have a special drill in the riding-school, over timber, walls, and hurdles, and are also taught to “stand fire." The coachmen have four liveries apiece, the state livery, which is a mass of gold; the epaulet livery, which is but a little less costly; the ordinary scarlet livery; and the plain black livery with white waistcoat, that is used on ordinary occasions. All the men live in the rooms above the sta­bles, and almost a military discipline is maintained. 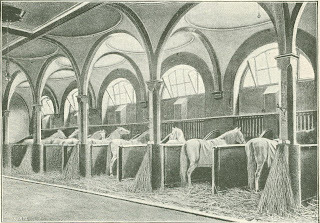 The first stable on the left contains eight good-looking bays and browns, that are used in the smaller carriages. Other small stables are passed, all in perfect neat-ness, and then comes the chargers' stable. 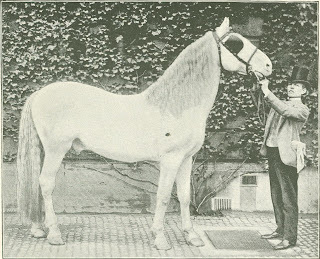 In it are many grand horses, particularly the big sixteen and a half hands bay horse “Sun­rise," that the late Emperor of Germany rode in the Jubilee time. All are perfect chargers, and will stand with their noses close to the largest guns when they are fired, and not twitch an ear. The next stable contains the small chargers, all about fifteen and three-quarters to sixteen hands, and equally well broken. Among them is the charger that the ill-fated Prince Rudolph rode in the Jubilee time. Indeed, all of the horses in these stables have some special association connected with the Royalties who have been on their backs. In the equerries' stable the horses are a trifle smaller than most of the others. On this side of the square also is the state harness room, a very interesting apart­ment. On the left hand is the “creams” state harness. The leather is red mo­rocco, and the heavy plating is gilt on a brass foundation. The weight is no less than one hundred and twelve pounds. This harness never leaves Buckingham Palace, and is used only on state oc­casions. The gilt crests and arms are of beautiful design and work, and the whole effect is superb. 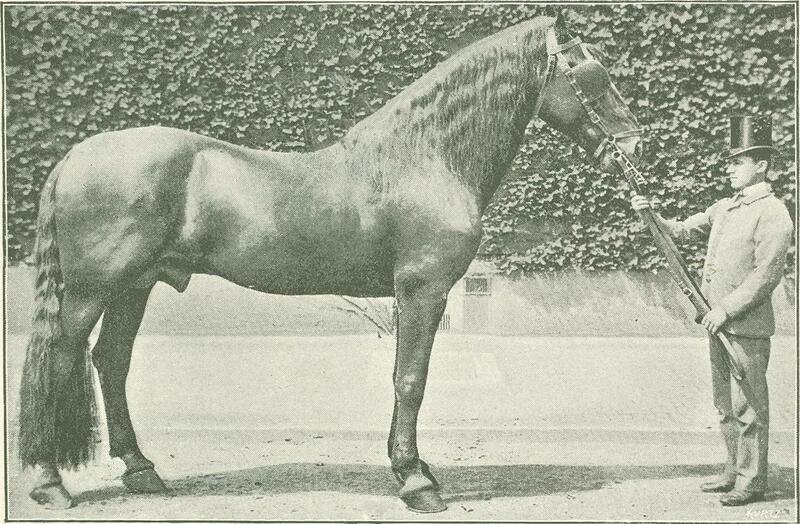 Hardly less handsome is what is known as the "black horse state harness." This is made of black leather, and the crest and royal arms are of brass; the trappings of this are covered with crests, and the effect is very beautiful. The weight of a single set is eighty pounds. In the same room is kept the state harness made for George IV in 1812, when he was Regent, which has never been re-leathered since it was made. It is extraordinarily massive and handsome, the royal arms are very beautifully cut, and the leather is as good now as it was three-quarters of a century ago. It weighs one hundred and twelve pounds a single set. In the thirty-two-stalled stable are thirty-two fine-bred horses from sixteen and a half to seventeen and a quarter hands, all glistening bays, so perfectly matched that almost any four could be placed in front of a carriage. The per­fect ventilation disposes almost entirety of any stable odor. The other half of this wing is occupied by the "creams" and "blacks," all stal­lions over sixteen hands, and the wheel­ers sixteen and a half. The heavy, mass­ive harness and the peculiar coloring of these horses make them look much smaller than they are. The breed originally came from Han­over in 1820; and the stud at Hampton Court, where they are bred, is the only pure specimen of the breed. Since their sojourn in this country not a mixed-col­ored animal has been born, which augurs well for the purity of the breed. They are of a curious cream color, with very silky manes, and tails almost touch­ing the ground. Their eyes are white, with pink centers, and their noses are pink, almost like human flesh. They are very tractable and sagacious, and I was told by Mr. Norton that they have wonderful memories. Of course they are used only on great state occasions; and the effect of the eight horses, with their massive, handsome harness, attached to the gilded coach, is very fine. "Occo" is the handsomest of the "creams," and is a very intelligent animal. Opposite the "creams" are the eight "blacks." The wheelers are no less than seventeen and a half hands in height. They also came from Hanover in the year 1820, and a special breed is maintained at Hampton Court. Their coats have a marvelous gloss, and their jet-black tails touch the ground. The effect would be a good deal height­ened if the red harness was used with the black horses, and the black harness with the "creams," but the opposite is the rule. The "blacks" are used on minor state occasions, and by the Prince of Wales when he holds a levee or appears at any state affair for the Queen. "Zulu," the wheeler whose picture is given, is one of the handsomest of these, and is seventeen and a half hands in height. The archway between the "thirty-two-stalled" and "creams" stalks & leads to the loose boxes and the Master of the Horse's stable. The whole of the side of the yard oppo­site the harness-room is occupied by the coach-houses, in which upwards of thirty state and semi-state carriages are kept. The center of interest is, of course, the state coach built in 1761, and which is known as "the glass coach." 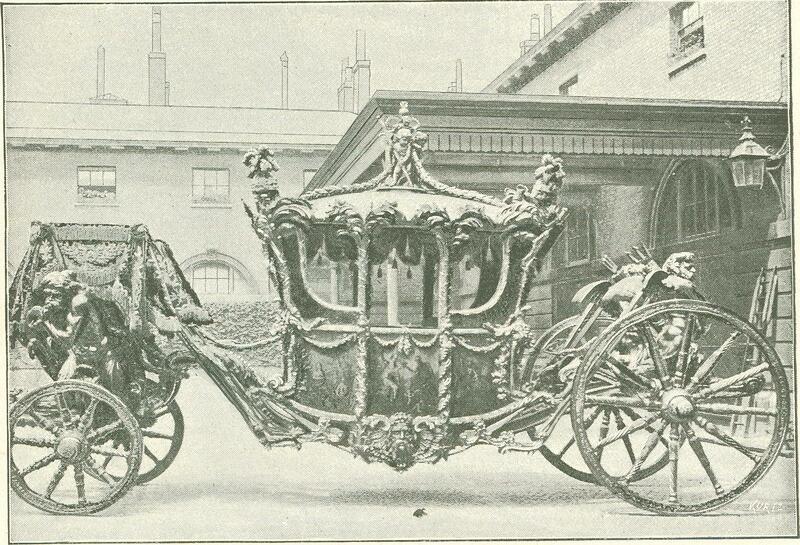 It is the most superb carriage ever built, and was designed by Sir William Chambers. The paintings on the panels are by the cele­brated artist Cypriani, and are so val­uable that five thousand pounds were offered for the panel on the back by a connoisseur. The front panel represents Britannia sitting on a throne, holding in her right hand a staff of liberty, attended by Religion, Justice, Wisdom, Valor, Foritude, Commerce, Plenty and Victory presenting her with a garland of laurel. In the background is a view of St. Paul’s and the River Thames. The back panel is Neptune and Amphitrite, issuing from their palace in a triumphal car drawn by sea horses, and attended by Winds, Rivers, Tritons, Naiads, and bringing the tribute of the world to the British Shore. The doors also have symbolic paint­ings, and the panels on either side rep­resent the liberal arts and sciences. The panels over the paintings are of plate glass. The whole of the carriage and body is very richly ornamented with laurel and carved work, hand­somely gilded. The length is twenty-four feet, the width eight feet three inches, the height twelve feet ; height of hind wheel, six feet ; length of pole, twelve feet four inches; and the weight is four tons. The carriage and body of the coach are composed of four large tritons, who support the body by four braces covered with red morocco leather and ornamented with gilt buckles. The two figures placed in front of the carriage bear the driver, and are represented in the action of drawing by cables extend­ing round their shoulders and the cranes, and sounding shells to announce the approach of the monarch of the ocean; and those at the back carry the imperial fasces, topped with tridents. The driver's footboard is a large scol­lop shell, ornamented with bunches of reeds and other marine plants. The pole represents a bundle of lances; the splinter bar is composed of a rich molding issuing from beneath a vo­luted shell, and each end terminating in the head of a dolphin; and, the wheels are imitated from those of the ancient triumphal chariot. The body of the coach is composed of eight palm-trees, which, branching out at the top, sus­tain the roof ; and four angular trees are loaded with trophies allusive to the victories obtained by Great Brit­ain during the late glorious war, sup­ported by four lions' heads. On the center of the roof stand three boys, rep­resenting the genii of England, Scotland, and Ireland, supporting the, imperial crown of Great Britain, and holding in their hands the scepter, sword of state, and ensigns of knighthood. Their bodies are adorned with festoons of laurel, which fall from thence toward the four corners. The inside of the body is lined with rich scarlet embossed velvet, superbly laced and embroidered with gold, as fol­lows: In the center of the roof is the star, encircled by the collar, of the order of the Garter, and surmounted by the imperial crown of Great Britain, pendant the George and Dragon; in the corners the rose, shamrock, and thistle, entwined. The rear lounge is ornamented with the badge of the order of St. Michael and St. George; and on the front the badge of the order of the Guelph and Bath, orna­mented with the rose, shamrock, and thistle. The rear seat fall has the badge of St. Andrew, and on the front the badge of St. Patrick, adorned with the rose, shamrock, thistle, and oak leaf. This coach is hardly ever taken out of the house now, and, indeed, until it was brought out to be photographed for this article, it had not been out for over a decade. It sways a great deal when in motion, and its immense weight makes it cut very much into the ground, while the length makes it very hard work to turn it. As a work of art it has no equal. The whole effect is more beautiful than can be described. It cost nine thousand pounds. The last time the Queen used it was twenty years ago, when she opened Parliament in state. 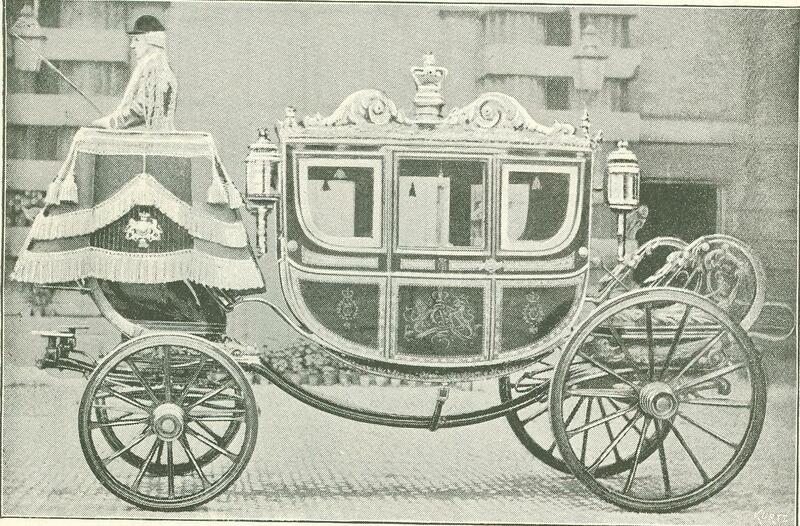 The state coach used nowadays is not by any means so splendid an affair, but it is a very handsome carriage. The panels are dark blue and have the royal coat of arms painted on them. The top is richly gilt, and the carving represents a crown. The hammer cloth is crimson and gold. Four flunkies stand on the little platform at the back, and Mr. Lane, the coachman, sits in state on the seat in front. This coach was used by her Maj­esty two years ago, at the Jubilee, when the "creams" made their latest appear­ance in public. 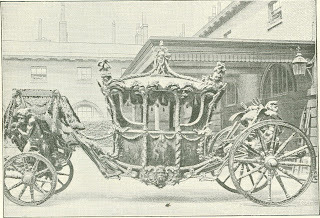 The carriage cost two thousand pounds. There are six other state coaches in scarlet and gilt, and the rest of the car­riages are painted dark blue, and can be used open or shut, as the Queen prefers. The whole collection of carriages and horses is a most interesting one, and it is surprising that it has so few visitors. 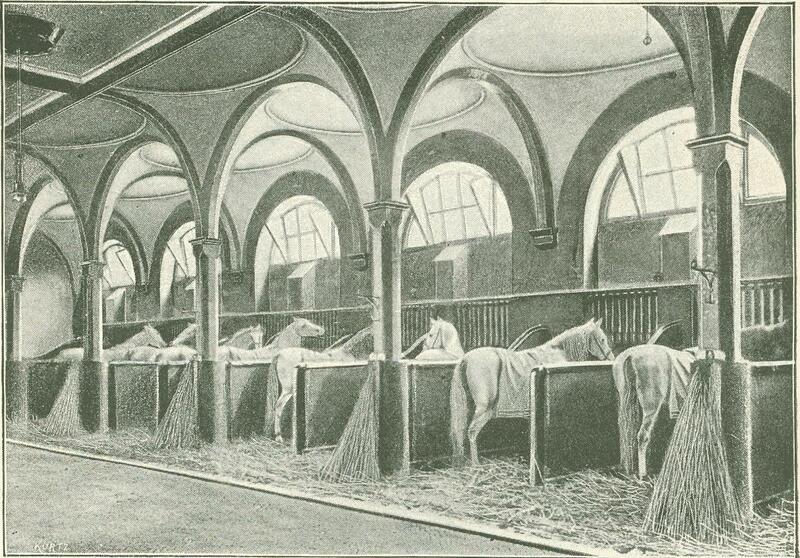 The Royal Mews can always be visited in the afternoon by an order from Sir George Maude, and many passes are issued to foreigners and country people; but Londoners very seldom take advan­tage of the opportunity to inspect this wonderful home of the Queen's horses. Perhaps they would go oftener if it were known that the admission card contains this sentence: “It is particularly request­ed that visitors will not offer money to the servants." Originally published in The Cosmopolitan Magazine. November 1889.